The development of Pondok Ranggon 1 and 2 reservoirs, Pondok Ranggon, Cipayung, East Jakarta is resumed.
" As initial stage, we will focus on Pondok Ranggon Reservoir 1, and then continued to the next reservoir. So far it has reached 15 percent"
Based in the information, three heavy equipments have been sent to the location that is located at RW 01 Pondok Ranggon. Later on, these reservoirs would have eight meters depth from 4-6 meters. 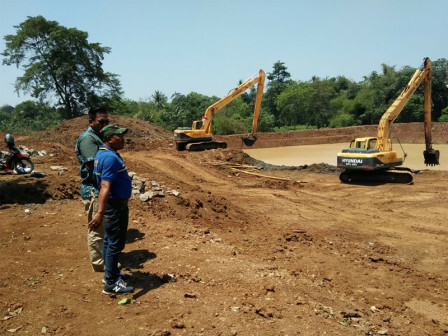 Development and Improvement of River System Section Head, Andika Purnomo added that the resevoir development has been carried out since early March. "Due to land acquisition problem in 2014, it was stopped temporarily. And now all lands have been acquired thus we can re-continue it," he told. Aside that, heavy equipment cannot reach the location due to narrow access, and was forced to send the small one. "As initial stage, we will focus on Pondok Ranggon 1 reservoir, and then continued to the next reservoir. So far it has reached 15 percent," he exclaimed. "It's targeted to be finished by 2020," he said.